Ginger | An Anti-Inflammatory Root | Andrew Weil, M.D. Ginger is the knotted, beige-colored root, or rhizome, of the Zingiber officinale plant. Its name is believed to come from the Sanskrit word singabera, meaning “horn-shaped” a reference to the fact many roots are curved and tapered, roughly resembling an animal’s horn. Native to southeastern Asia, it is now cultivated and also grows wild in Africa, the Caribbean, and Australia. The plant thrives in warm climates and grows three to four feet tall, with reed-like leafy stems and flowers. Cultivation and use of ginger in Asia dates back at least 4,400 years; its use is mentioned in ancient Chinese and Indian writings. In addition to its long history of use as a culinary spice, references to ginger’s medicinal uses can be found in ancient Chinese, Indian, Arabic, and Greco-Roman writings. Ginger is chiefly known as an anti-inflammatory agent, nausea reliever and digestive aid. Ginger is widely known for its digestive effects. For example, many people are familiar with the use of ginger ale for easing an upset stomach. This is also the area that has been extensively studied. A review of randomized clinical trials found the herb to be an effective option for relieving nausea and vomiting. 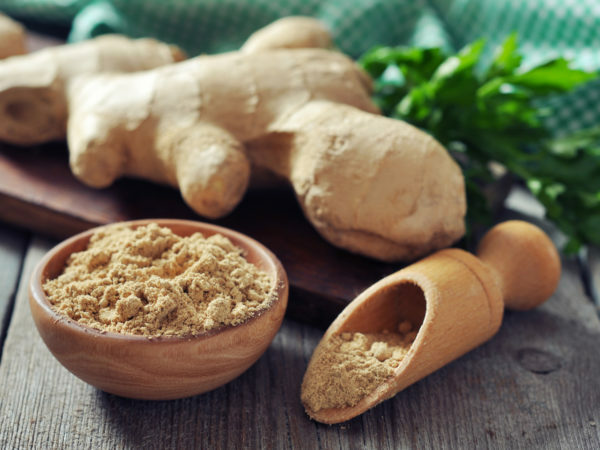 In the review of six human studies, ginger was found to be superior to placebo and as effective as conventional medication for treating nausea and vomiting in postoperative patients. Another review found ginger to be significantly more effective than placebo in reducing the frequency of vomiting and intensity of nausea during pregnancy. Ginger has been used in traditional medicine for reducing inflammation, and studies show that ginger is effective in relieving the pain of menstrual cramps. Studies are inconclusive regarding its effectiveness for relieving the pain of osteoarthritis. Whole fresh root, crystallized ginger, honey-based ginger syrups, capsules containing powdered ginger extracts and alcohol extracts. Ginger may act as a blood thinner, so use caution if you are currently using anticoagulants. The NMCD considers ginger “likely safe” for most people, but the herb may induce mild side effects such as heartburn, diarrhea, and stomach discomfort. High doses may cause a burning sensation in the stomach; to minimize, take ginger with food. Curb use at least two weeks before scheduled surgery as ginger may affect blood clotting, particularly at doses greater than four grams per day. Those undergoing chemotherapy should consult their doctor if using ginger at medicinal levels. Do not use more than 1,000 mg of dried ginger per day during pregnancy. Select only products with 100 percent pure ginger. For inflammatory conditions, two to three grams per day of powdered ginger, taken in divided doses. For nausea and prevention of motion sickness, take one gram as a preventive and 500 mg every four hours as needed, or eat two pieces of crystallized ginger. For morning sickness, take 500 mg morning and night (do not exceed 1,000 mg per day). For cold relief, brew tea with one-inch piece of peeled and grated ginger root per two cups of water; bring to a boil, lower heat and simmer for five minutes. Add two tablespoons fresh lemon juice and honey to taste. Let cool slightly and strain. When I use fresh ginger, I often divide the specified amount in half, adding half at the beginning of cooking and the remainder at the very end. Doing this infuses the dish with both aggressive and mellow ginger notes. One way to bring out the unique taste of ginger is to use the high heat of stir-frying. Also, grated ginger complements fresh citrus juices – try some in lemonade on a hot summer day. As for medicinal use, ginger is the best herb for controlling nausea, regardless of the nausea’s origin. Many people who suffer from motion sickness carry ginger candy for relief; in my experience it works quite well. Ding M, Leach M, Bradley H. The effectiveness and safety of ginger for pregnancy induced nausea and vomiting: a systematic review. Women Birth 2013; 26(1):e26-30. Reviewed by Tieraona Low Dog, M.D., March 28, 2014.